For Your Monsters: Cadet Sweet Potato Steak Fries. 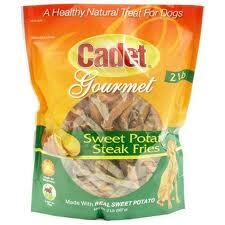 Cadet Sweet Potato Steak Fries are one of my dogs favorite treats. Made from nothing except sweet potatoes, these treats are a naturally, healthy way to let your dog get it’s chew on. These little guys are literally dried sweet potato fries, they offer a toughness dogs love and they are easily digestible, unlike rawhide. I for one am super excited that the market for rawhide alternatives is growing by the day. There is no need to feed your dog dead animals or animal by products. Now a days you can walk into almost any pet store and find many veg treat options. Veg dog food is a bit harder to find but lately I have been seeing it stocked in more stores as well. I cannot seem to find a website for Cadet but I can find this product for sale all over the web. I have attached a link to them on Amazon so you can peep the scene. http://www.amazon.com/Cadet-2-Pound-Sweet-Potato-Steak/dp/B005AOYC14 Cadet Sweet Potato Steak Fries On Amazon. ← Don’t Fall Into Bad Habits.